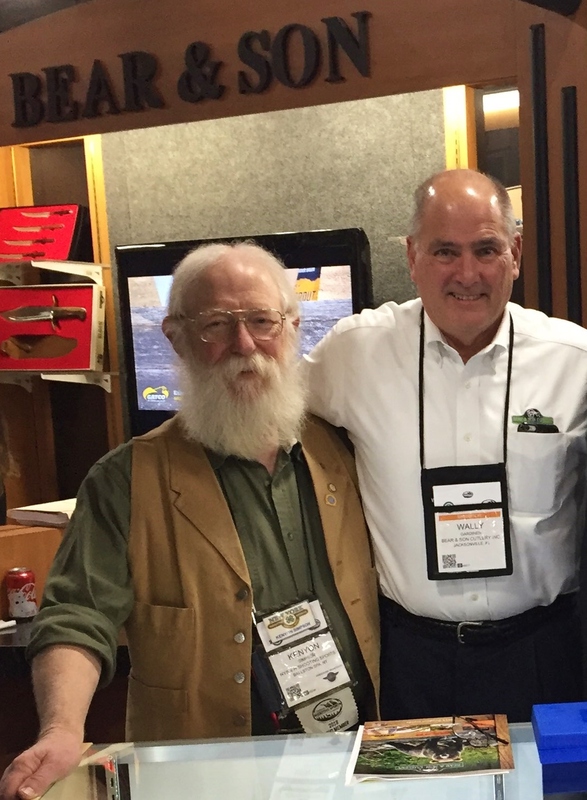 The day started off with a visit to Tri-Star Arms to look at shotguns. The Viper G2 (gas operated) Two Stock Synthetic Como Youth Model, is a 20 gauge that includes both a regular stock, a compact stock, and an extendable 24” barrel. The extension makes it a 27” barrel. We also looked at the Viper G2 SR Sport in 20GA. This gun is a striking two-tone firearm. The black synthetic stock is accented by an anodized red receiver and magazine cap. We stopped at Elite First Aid where we purchased our first aid kits last year. The new product they have this year is the Patrol Trauma Kit Level I. The kit contains a cat tourniquet, emergency trauma wound dressing, EMT shears, conforming gauze 4” x 4’, 3” cohesive bandage, combat gauze with Quikclot, and a pair of Nitrile gloves. The kit is housed in a one motion, rip-to-open pouch that folds open to the user has access to everything inside the kit. The exterior of the pouch has Molle straps for adding an additional tourniquet if so desired. 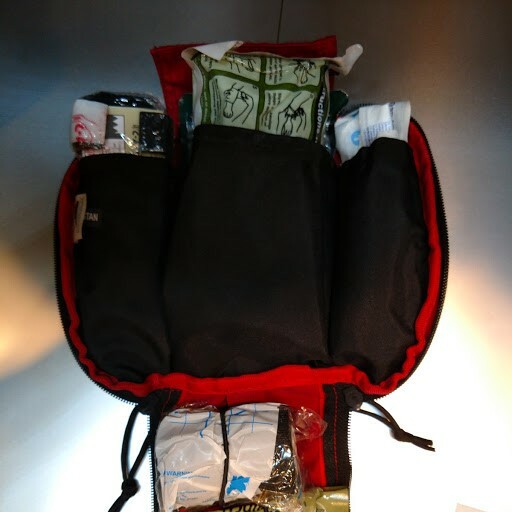 Elite First Aid’s Trauma Kit Level I. Note how the kit unfolds flat so you have access to all of the supplies. 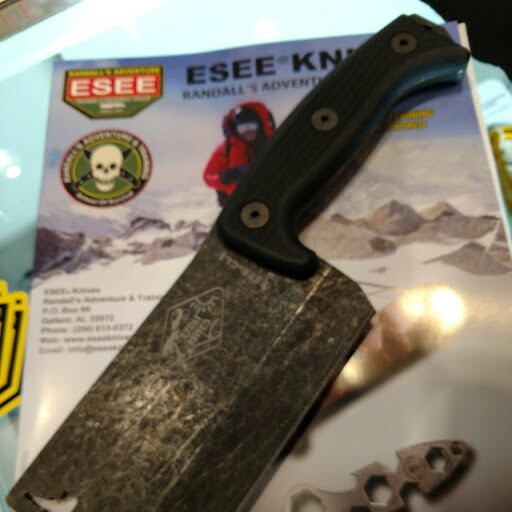 Down the aisle from Elite First Aid was ESEE Knives . 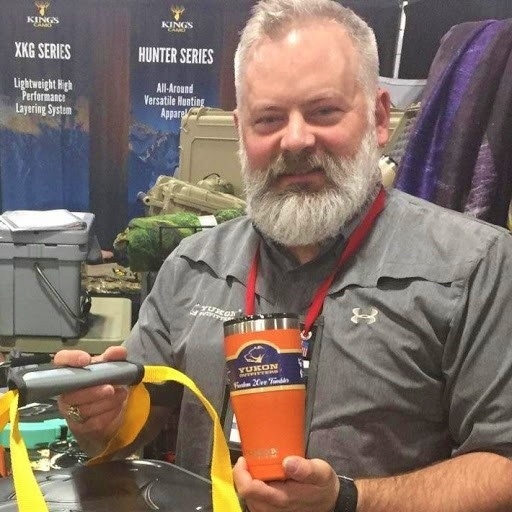 This company specializes in wilderness knives and kits for the parent group, Randall Adventure’s, who teaches wilderness existence skills in tropical climates like the Amazon. We looked at several knives they have developed, including a camp cleaver called the Expat Cleaver. The weight is heavy enough to baton wood and chop through bones, while also being able to chop vegetables and meat. The side of the tall blade can be used to scoop the chopped materials. The blade is made of 1095 carbon steel. ESEE’s Expat Cleaver – made of 1095 steel with tumble finish. 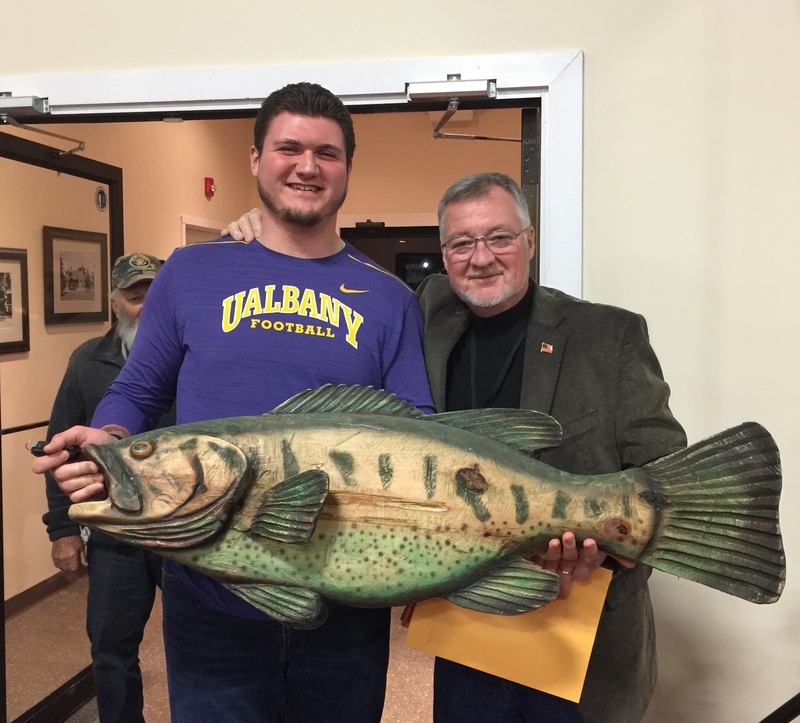 At Rivers Edge Products, we looked at a variety of hunting or camping themed items that will appeal to the hunter and non-hunter alike. The company offers cutting boards, historical sign replicas, mugs, puzzles, and playing cards. The designs on each of the products varies from songbirds, big game scenes, fish, and patriotic genres. The salesman informed me that the hottest product they had during the show was fish sandals. Yup, you heard that right. The sandals are shapped like red snappers or big mouth bass, with your toes slipping under the gill plate and sticking out the mouth. They had around 400 inquiries about the sandals. 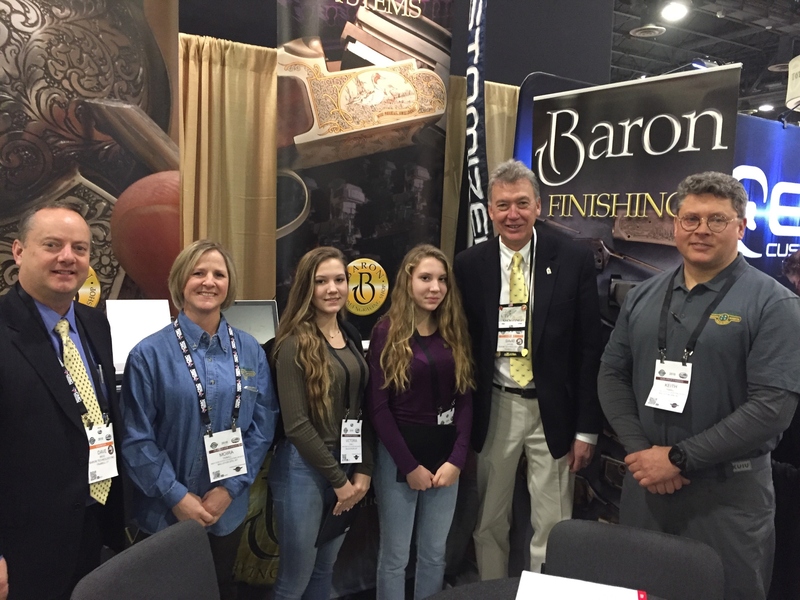 At Baron Technology, Inc. (Baron Engraving), we spoke with Dave Baron, company CEO and owner, and Dave Miles, company President. 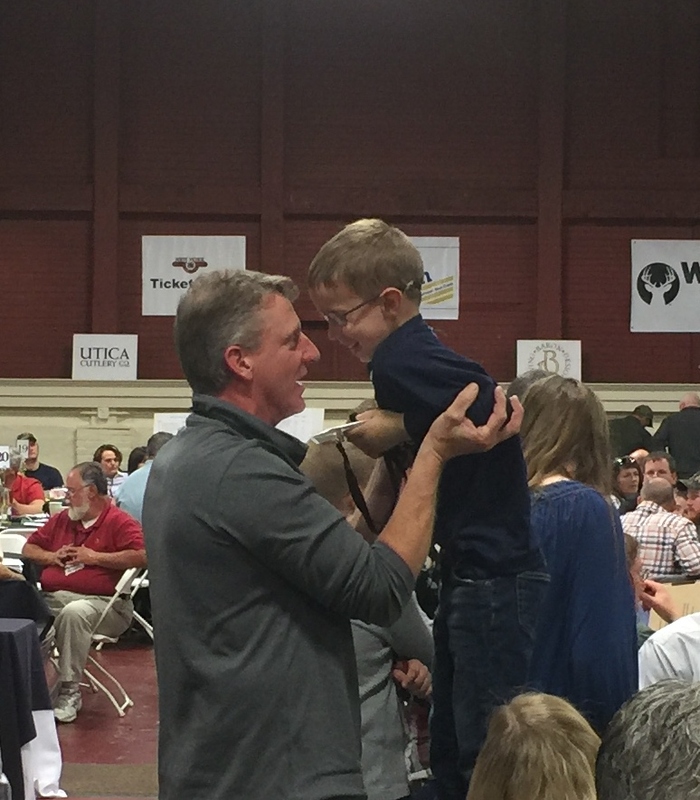 Dave Miles is a graduate of Cornell University. 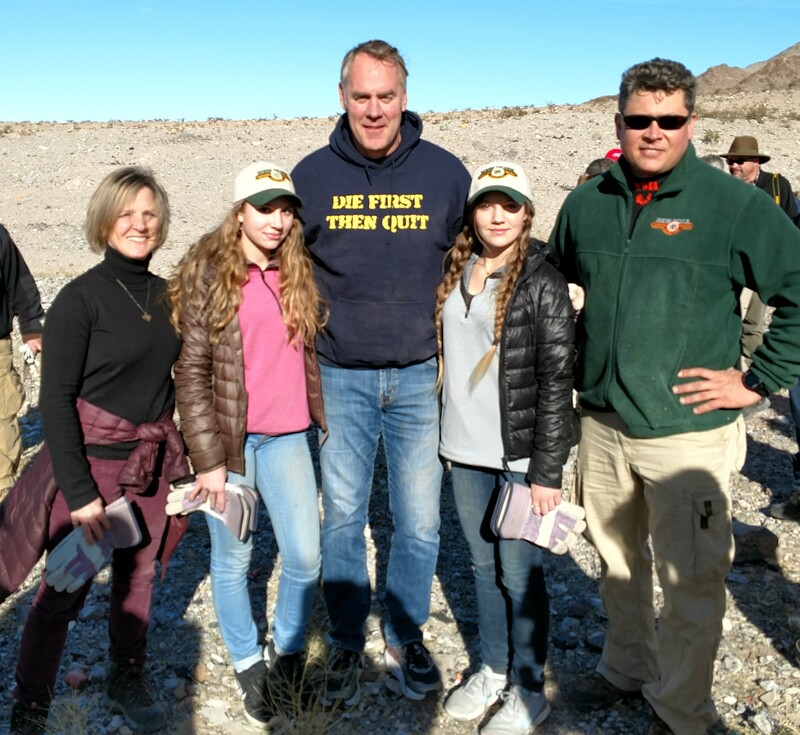 Visiting Barron was Cyndi Flannigan, the Executive Director of the Youth Shooting Sports Alliance. 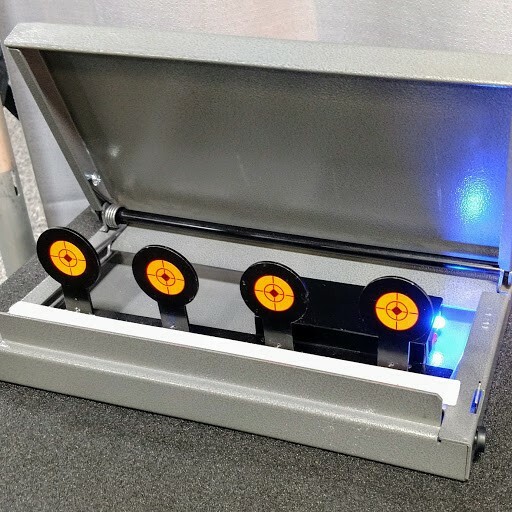 The portable, programmable Air Rifle Range from Air Venturi. The app will be iOS and Android compatible. 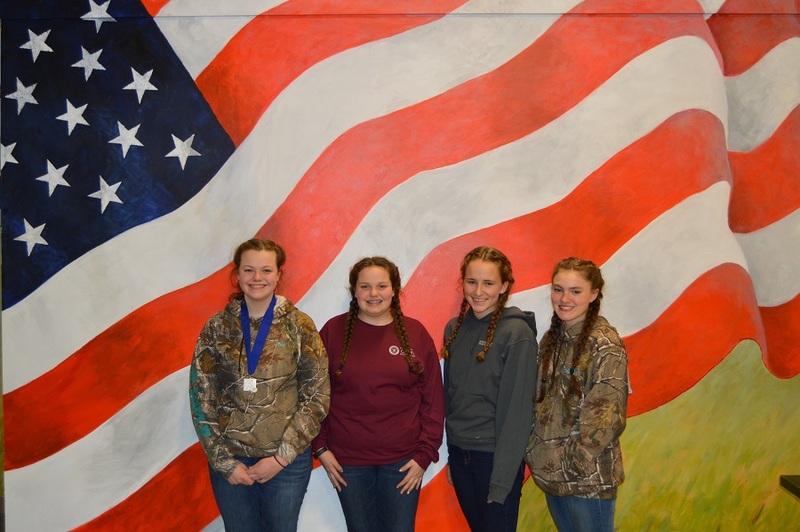 On January 18th through the 20th the Wyoming County 4-H Shooting Sports team which is also affiliated with the Warsaw American Legion and the New York State Rifle & Pistol Association traveled to Camp Perry in Ohio to compete in the Camp Perry Open. 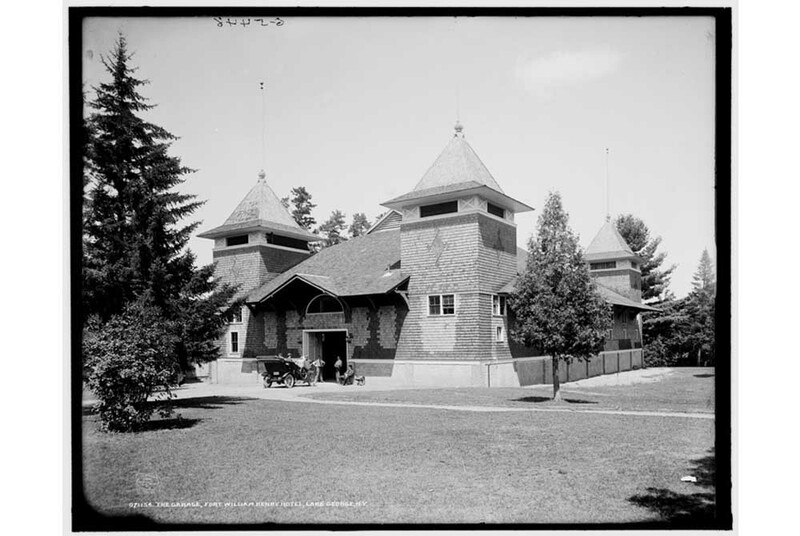 Competitors were from Connecticut to Montana and as far south as West Virginia. 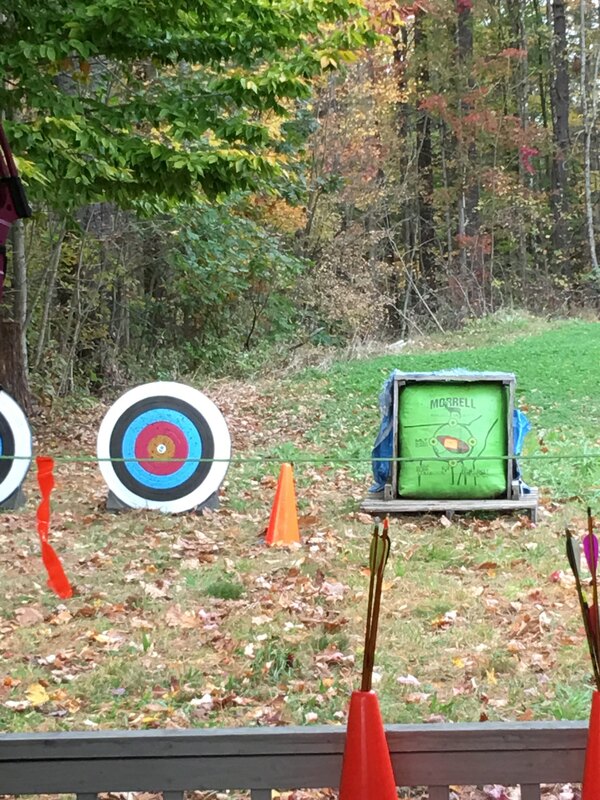 Day one of the competition was in three-position Air Rifle. Hannah Spicer, age 15, of Pavilion broke her personal best and placed 18th, Hannah Siewert, age 15, from Perry also broke her personal best and placed 23rd, and Abbey Paddock, age 12, of Perry also beat her personal best and placed 66th. 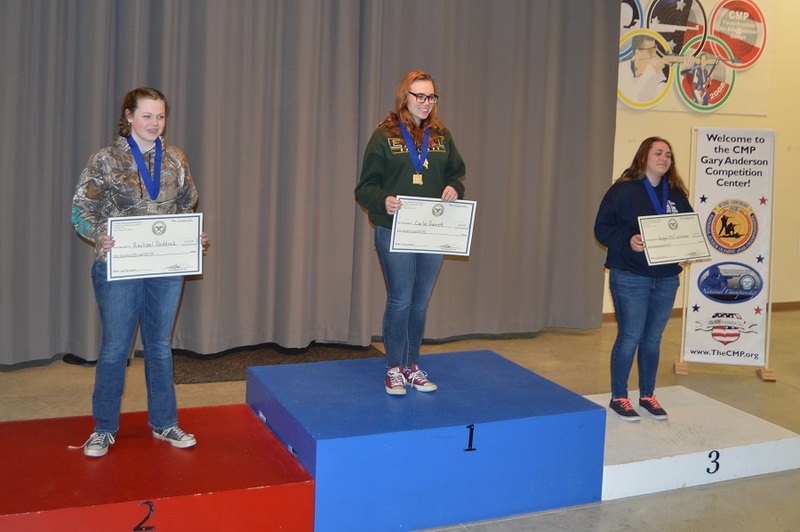 Rachael Paddock, age 14, from Perry placed 5th which qualified her for the finals match where she was able to move up to second place capturing the Silver Medal. 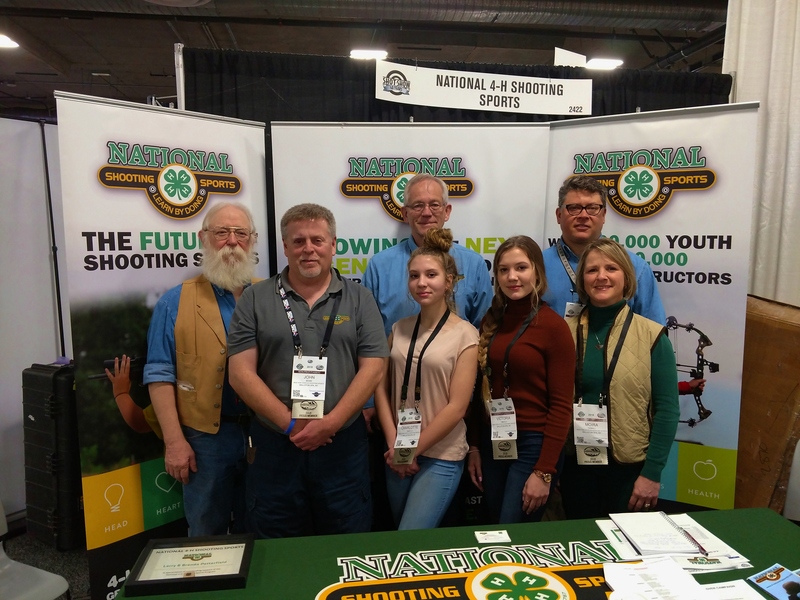 For more information on 4-H Shooting Sports or other programs offered by Wyoming County 4-H, please contact the office at 585-786-2251. 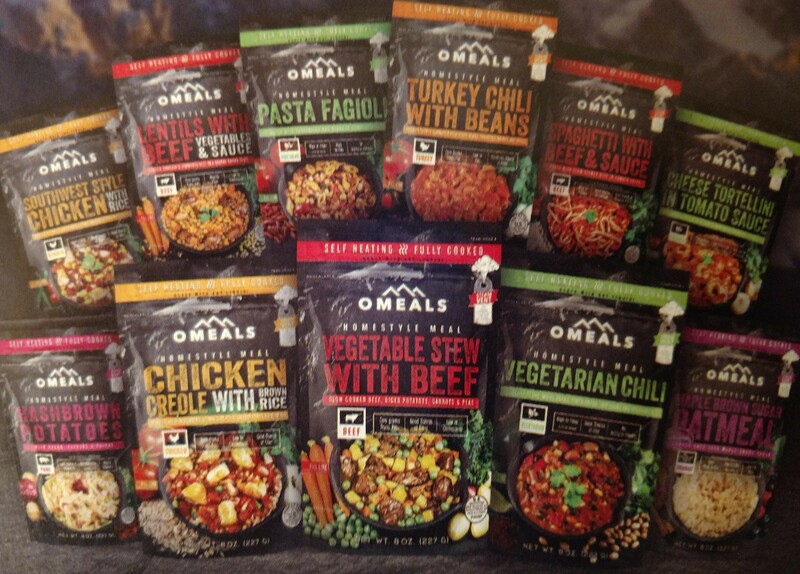 •	Nex-xos has developed a line of self-heating, home style meals in eleven flavors, with 6 more flavors being developed. Ivis Rubero, of Nex-Xos encouraged us to try a sample of the product of the Omeals which uses 3-5 ounces of any fluid to cook the meals in 3-5 minutes. The sample was Lentils with Beef and it was excellent quality. The full line comes in waterproof, light, and packable packaging for backpacking. Omeals menu options from Nex-Xos. •	AMP-3 LLC sells a series of first aid kits, bags, and amateur radio products. Their first aid kits run from basic to Outfitter Clinic-in-a-roll. The Outfitter includes a compartment for the following: Trauma, Musculoskeletal, Dressings, Bandages, Medical Tools, Admin, Irrigation, Misc. Wound, Dental Kit, Blister Kit, SAM Splint, Eye Wash, Medication Module 1 & 2, Tape & Wrap, and Personal Protection. Owners Dave and Beth hand pack each order, rather that purchasing pre-packed kits to assure that each kit is assembled correctly. 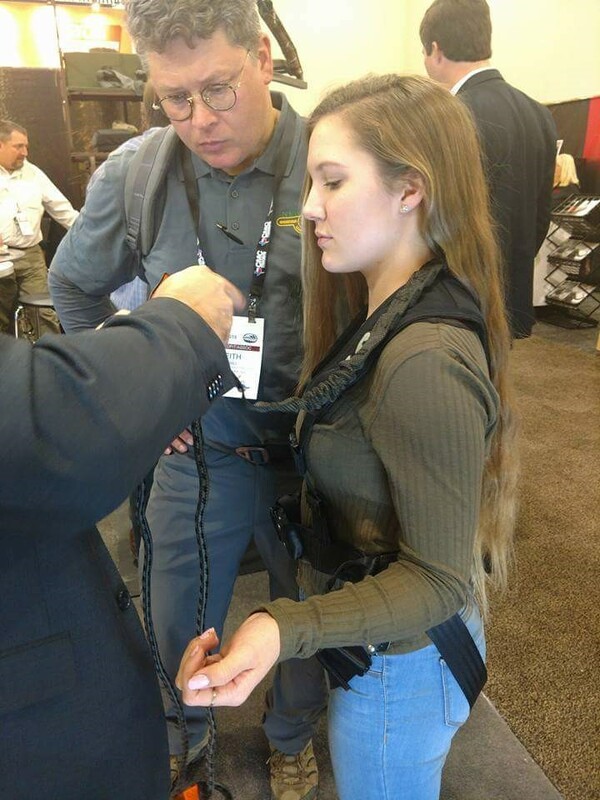 •	Over at BioLite, we spoke with Johnathon Kosakow, North American Sales Manager. 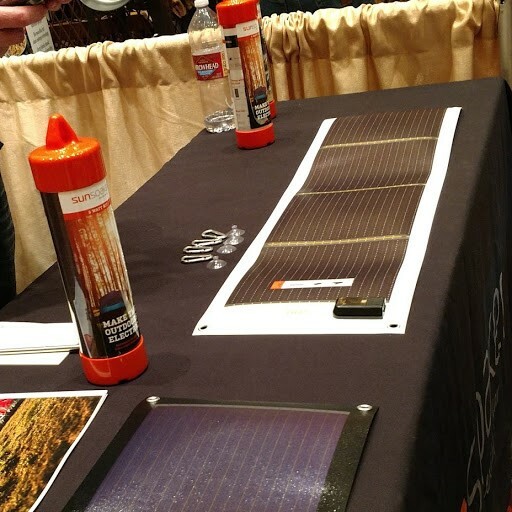 BioLite produces a variety of sustainable energy products from camp stoves, solar LED lights, a solar lighting system, and as of last year, a smokeless fire pit. The fire pit burns either wood or charcoal and uses patented airflow technology to heat and burn the materials in the smoke before it is able to leave the pit. BioLite also has a division that works to bring clean burning stoves to Sub-Saharan Africa, where the inhalation of regular wood smoke within the kitchen area has left many children and adults with permanent breathing illnesses. 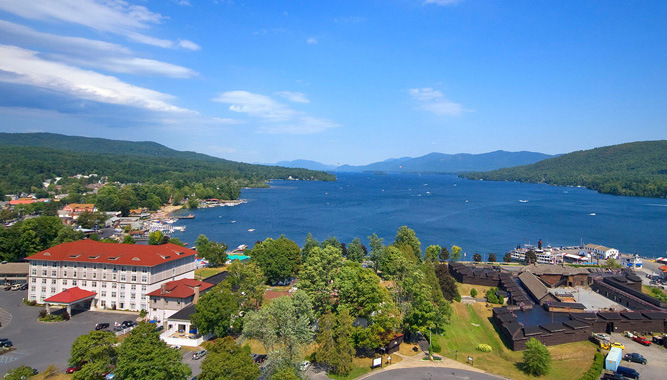 We are going to connect the NYS 4-H Renewable Energy Specialist, Charles Malone with Johnathon. 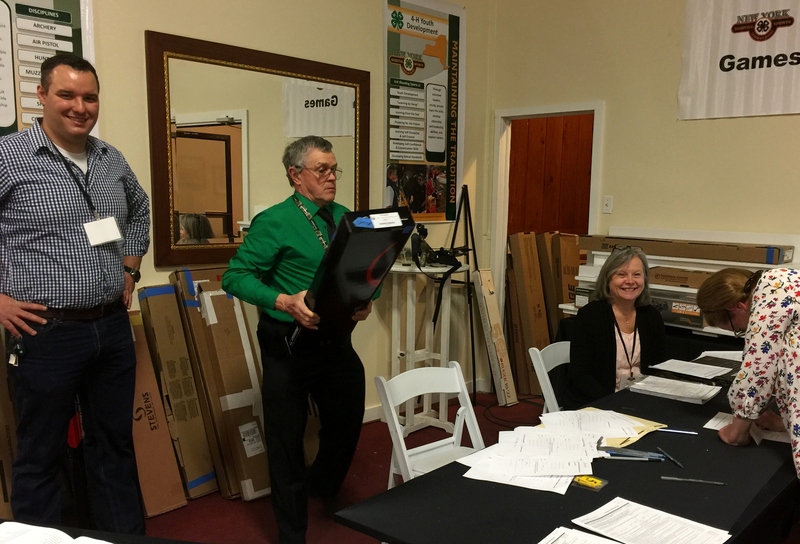 •	At Harvestright they were showing off their home freeze dryer model. The home model is the smallest of one of three models, about the size of an apartment washing machine, that the company offers at this time. Long-term storage is one of the benefits of freeze drying – as much as 25 years. According to the company’s flyer, traditional dehydration and canning require high temperatures that the company claims degrades flavor, texture and nutritional content. We sampled some of their freeze dried red raspberries and they were delicious! •	At Tren LLC, we were introduced to NAQWA SWR-Spring, a portable drinking water resource by Vernon Hatch, President of Tren. 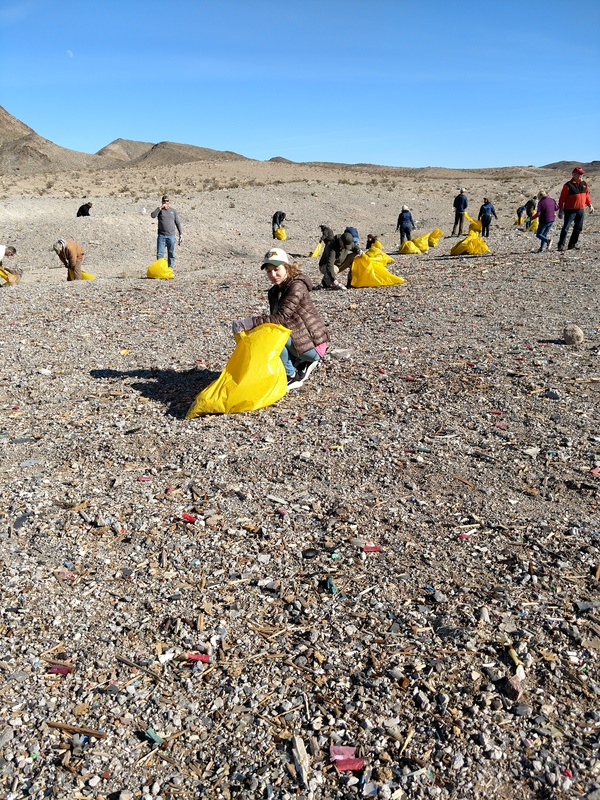 The NAQWA is a filter that is not based on ceramics or charcoal but instead uses molecular cleaning, accomplished through track membrane technology. The track member consists of a polymer film with 10 microns deep. Each square centimeter of membrane contains hundreds of millions of pores of 0.2-0.4 microns in diameter. This membrane combines two forms of water recovery: (1) purification of bacteria and other contaminants, and (2) physical and informational water restructuring. The whole unit weighs 3 ounces. •	Frostime claims their product, the Blizbox, is a revolution in portable cooling. 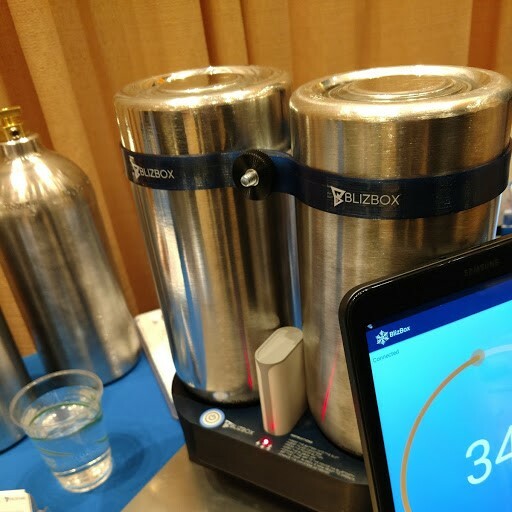 The Blizbox uses carbon dioxide in canisters mounted as part of a patented cooling device to control, monitor, and maintain refrigeration temperatures for up to 24 hours. If more time is needed, the CO2 canisters can be replaced. The group works with research & development at North Dakota State University. The BlizBox CO2 cooling unit from Frostime. The tanks are refillable. The main meeting for the day was with Charles Daly salesman, George Woford. 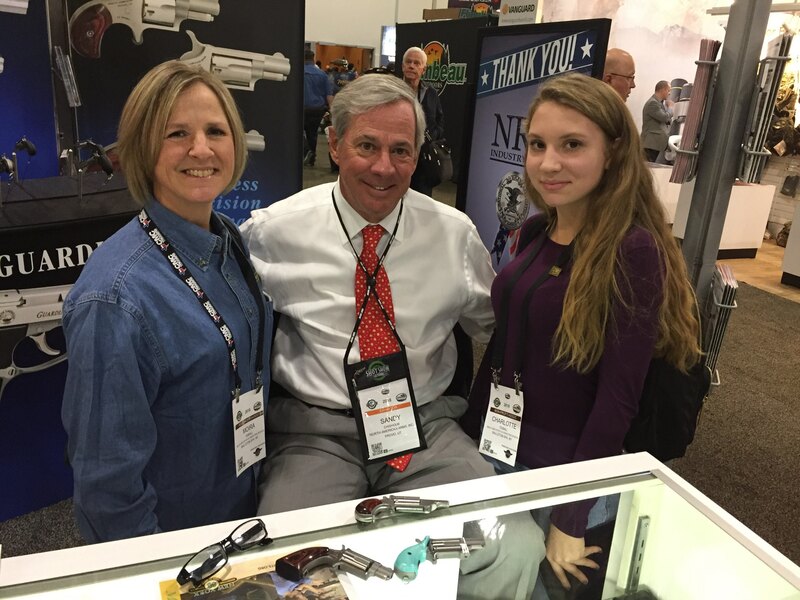 Charles Daly is distributed through Chiappa, whose US location in Dayton, OH. 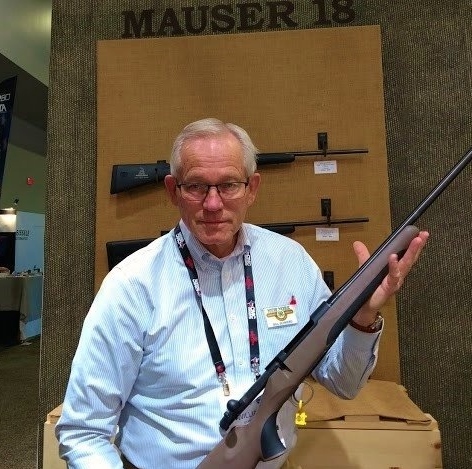 Charles Daly is once again offering the Model 600 Semi-Auto in 12 and 20 gauge, they even have a left-handed compact model in 20. 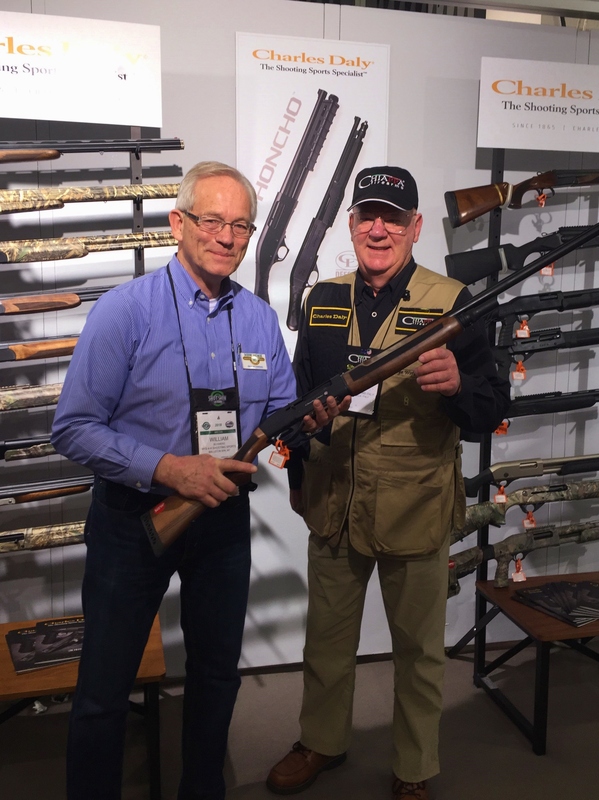 We also looked at the Model 601 Semi-Auto which has an extremely affordable retail price. The Model 301 Pump-Action currently is available only in right-handed 12 gauges. 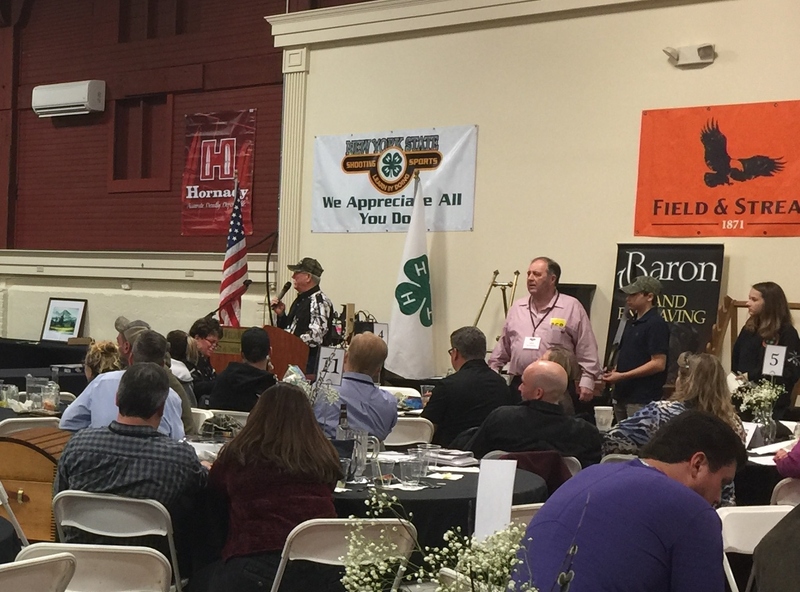 North American Arms owner, Sandy Chisholm, continues to be a strong supporter of the NYS 4-H Shooting Sports program and works with Dave Baron owner of Baron Technology, Inc. (Baron Engraving) to make sure that one of their small-revolvers is included in our recent Annual Banquet & Auction events. Often times, the firearm is custom engraved by the artisans at Baron. 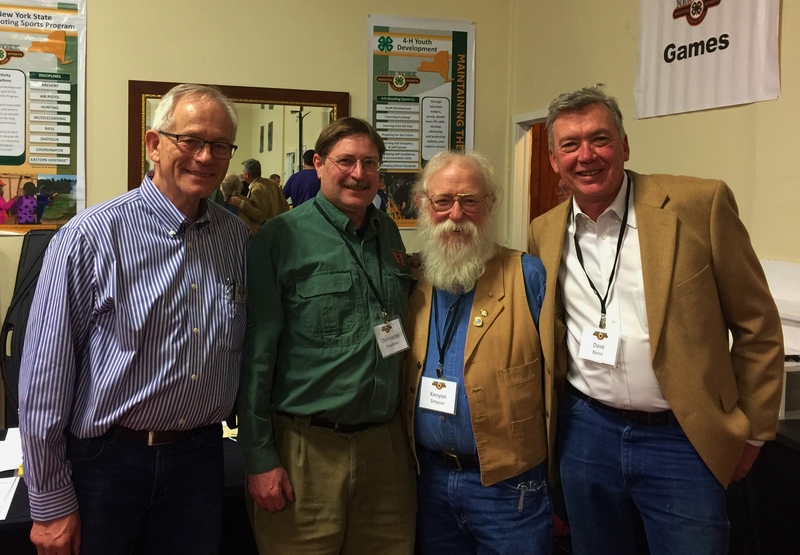 The day also held some interesting seminars on hunter and shooting sports recruitment. 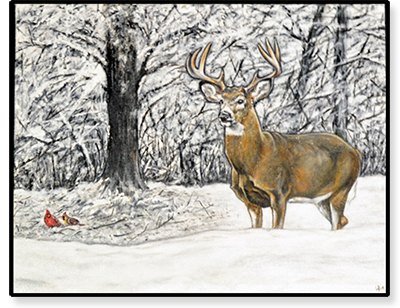 Data from the US Fish & Wildlife Service shows that hunter numbers continue to decline faster than new hunters are recruited. This has spawned the R3 initiative to Recruit, Retain, and Retrain hunters, fisherpersons, and shooting sports participants. Recruitment of youth who are interested continues to the primary effort, but has now expanded to non-traditional populations. 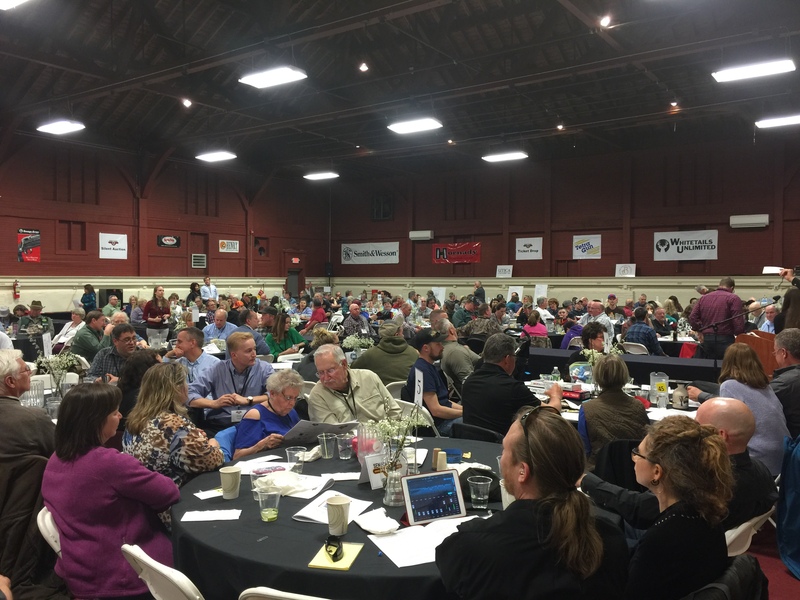 Adults who are interested in learning to hunt or shoot but have no one to take them have become a focus audience. 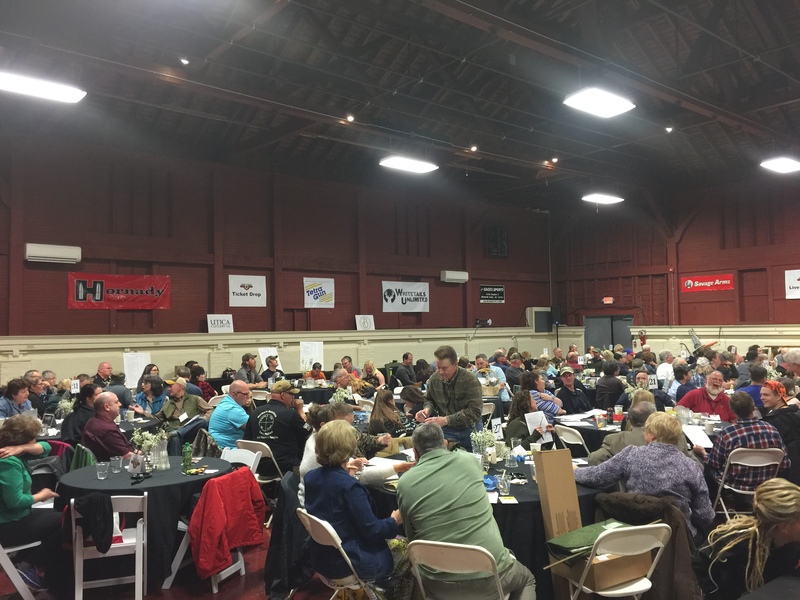 One of the speakers from Quality Deer Management Association (www.qdma.com), Hank Forester, spoke about the Field to Fork program. 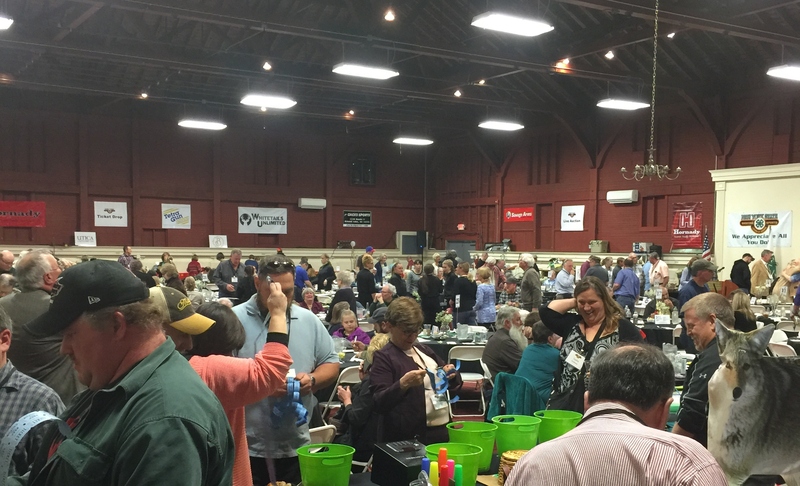 This program was introduced to New York this year and recruits interested adults through farmers markets where many adults are looking for a more natural alternative to supermarket meat counters. 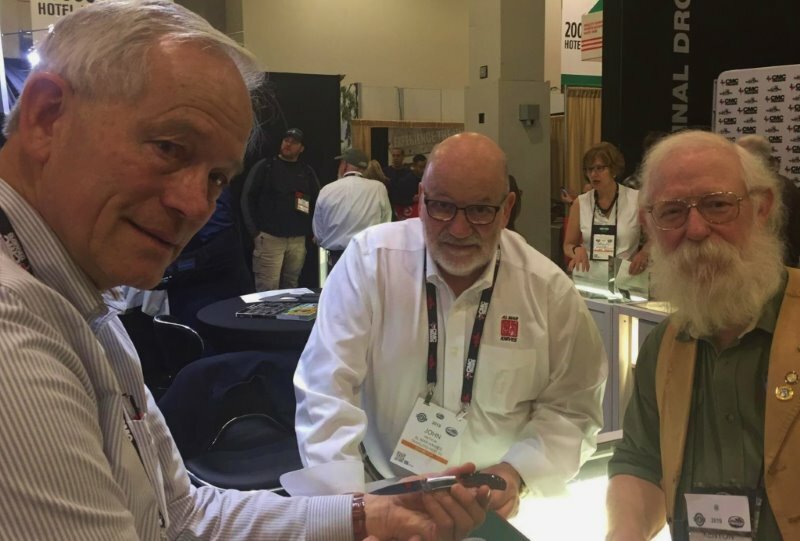 The program has several years of success in Georgia plus seven participants who harvested deer in New York in 2018 and has now been expanded to offering these hunting opportunities to non-hunting employees at companies like Ruger and Sig Sauer. 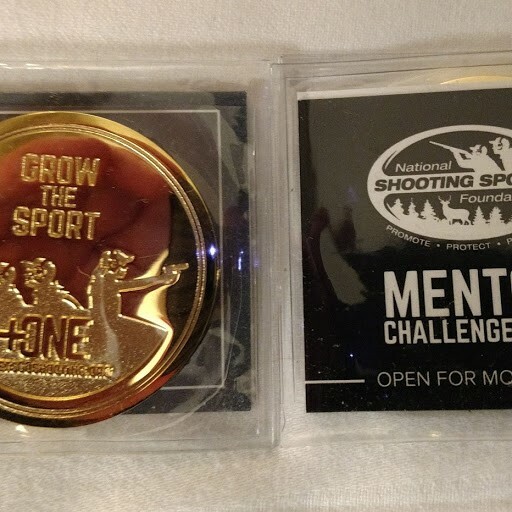 The National Shooting Sports Foundation has introduced 2019 as +One: Grow the Sport. 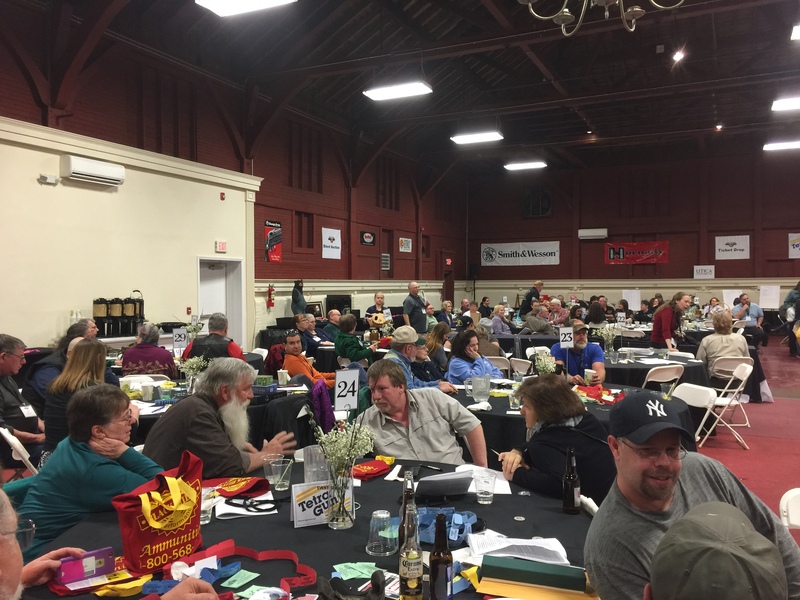 A challenge to all hunters and shooting enthusiasts to take someone new afield. 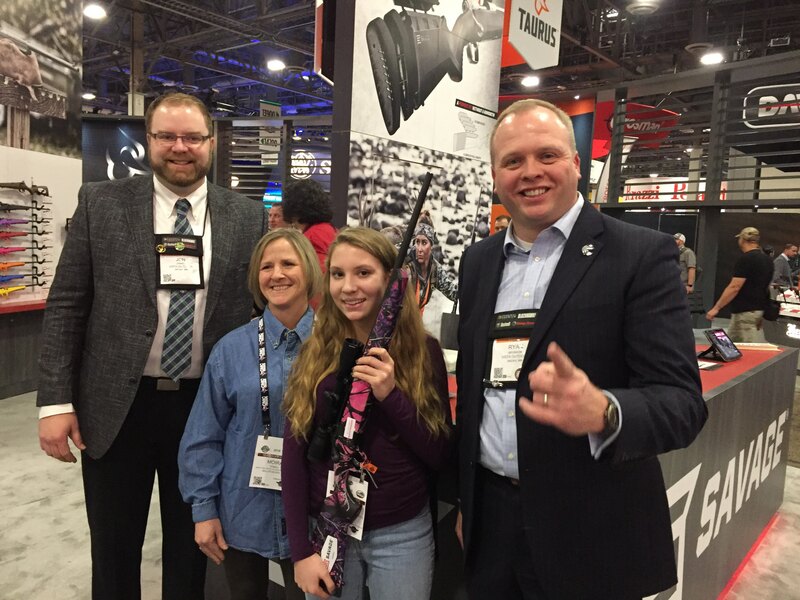 The usual Blog entries for SHOT Show begin with Media Range day on Monday, however, the snowstorm altered New York State 4-H Shooting Sports travel plans and the travel plans of many others coming to the SHOT Show. 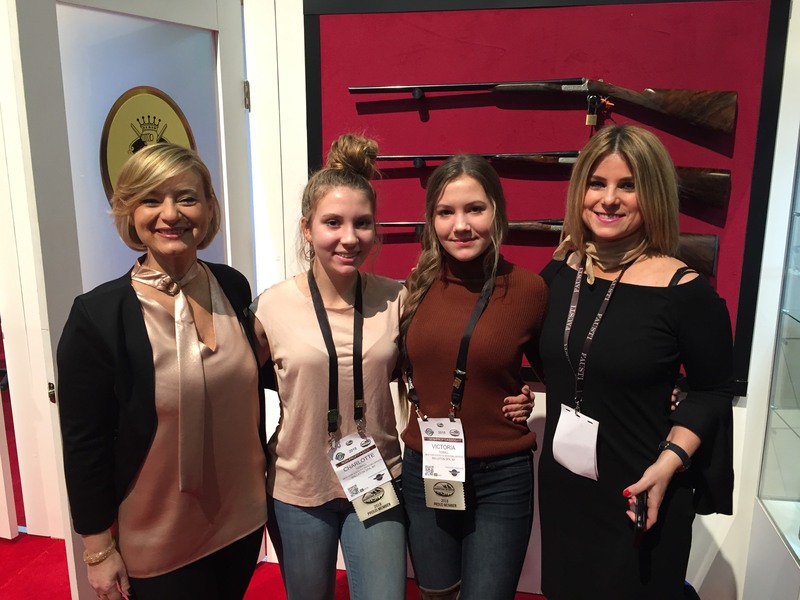 Tuesday started off as usual, though, with thousands of exhibitors and attendees making their way through the expansive show floor. 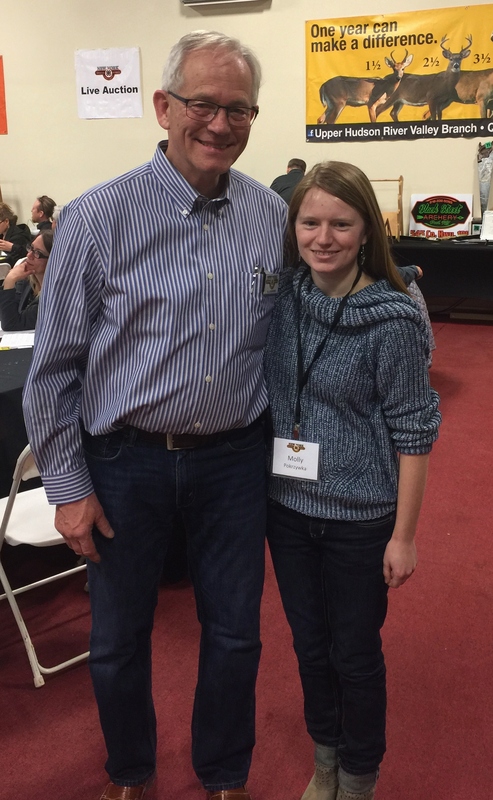 The first stop was a chance meeting at Doom & Bloom LLC, with owners, Dr. Joe Alton and Amy Alton, ARNP. This family owned company creates specialized trauma kits and offers advanced first aid training. 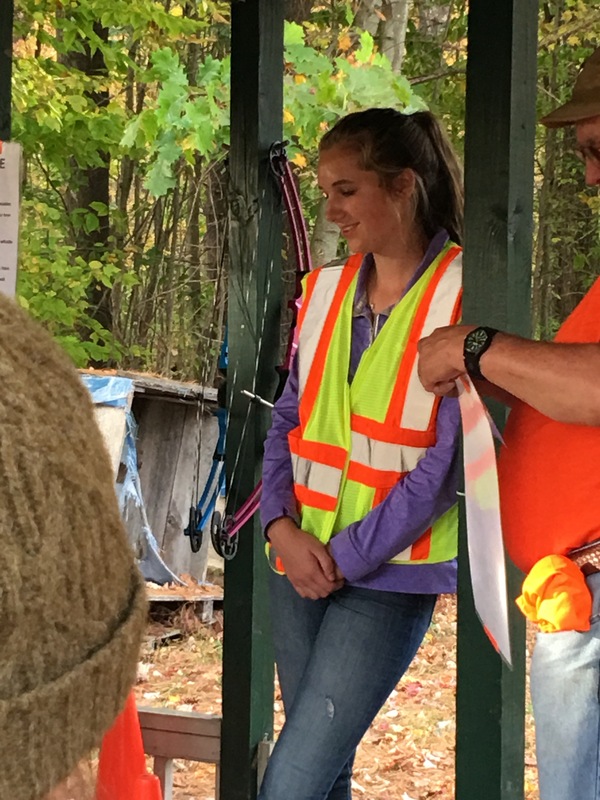 By chance, they are looking for a place in the Albany, NY/Capital District area to host one of their first aid trainings and we might be able to help with that. 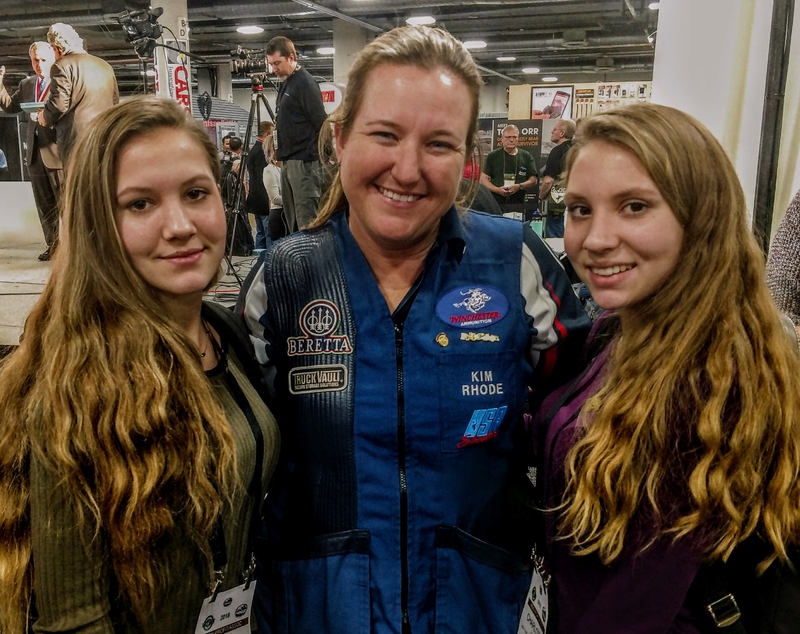 At the next company, we spoke to Krystal Giltner with Blitz. Blitz has been making metal cleaning/treatment products since 1912. They offer a full line of gun, reel, optic, and even bow clothes. All of their products are available with your logo on the packaging in lots as small as 100. 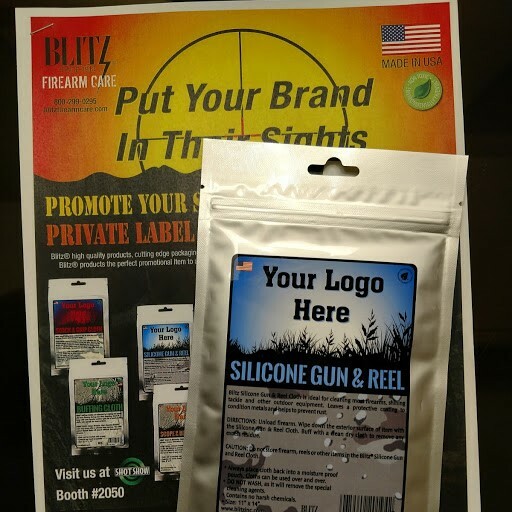 From Blitz Firearm Care a Gun/Reel cloth set up for custom labeling. 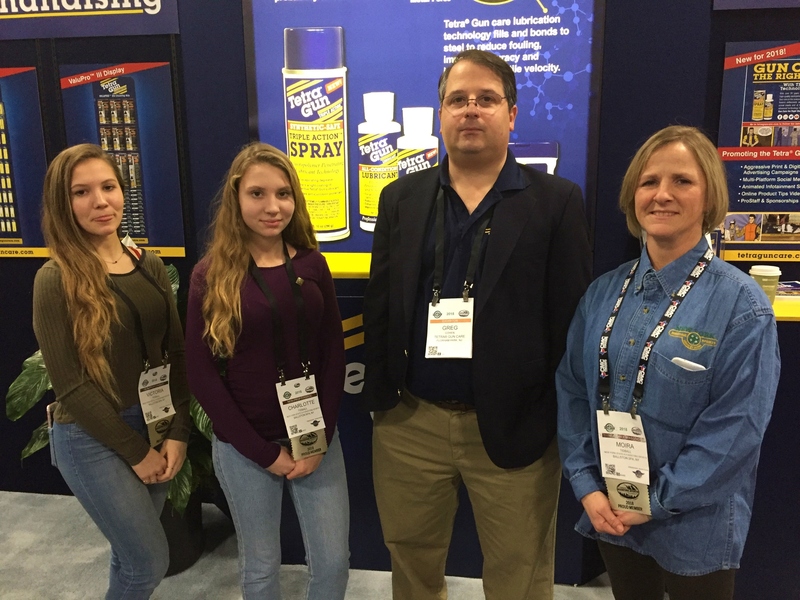 A couple of rows over from Blitz we spoke with Chris Jensen, Sales & Marketing, of Exotac. If you are not familiar with Exotac, they make machined firestarters. 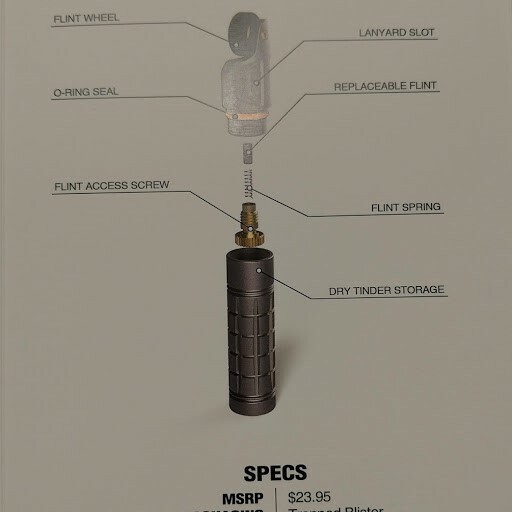 One of their newest products is called the nanoSPARK which has a flint wheel mounted with o-ring sealed threads to a knurled dry tinder storage compartment and an MSRP of $23.95. The nanoSPARK from Exotac, is a miniature flint wheel mounted on a waterproof tinder container smaller than a standard lighter. The biggest meeting of the day was with Ken Bathurst, Sales Manager of Industrial Revolution. Industrial Revolution owns and distributes a number of brand names. 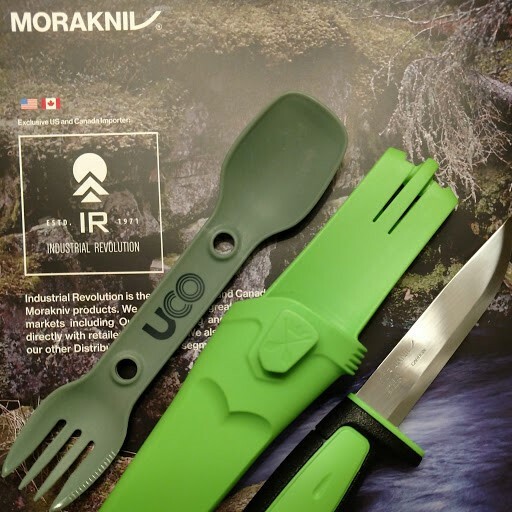 They are the exclusive United States and Canadian distributor for Morakniv of Sweden. We even met several of the employees from the Morakniv plant in Mora, Sweden. 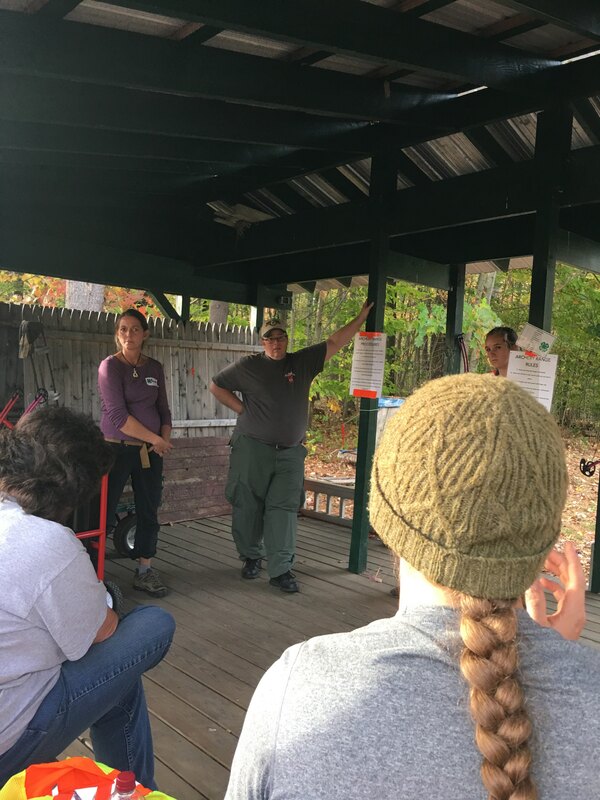 The staff at Industrial Revolution and Morakniv were very excited to hear that NYS 4-H is working on Knife & Ax Safety Guidelines for camps and general 4-H programs. One of their newest products is the Model 511. Perfectly sized to fit a smaller hand, Model 546 has a substantial blade guard and a retail price with either carbon or stainless steel for $12 or less. A great knife for beginners. They also have the Rookie Safe Knife, which has a safe, rounded blade and blade guard designed for those new to woodcarving or whittling with a retail price of $19.99. 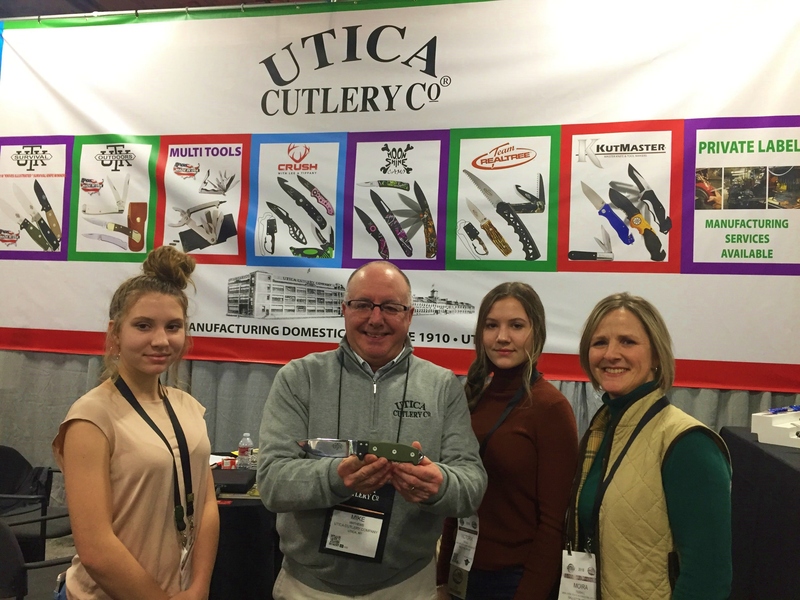 Their UCO line now has a matched two-piece spork set, where the molded nylon knife and spoon nests and snaps into the fork – so you can hold the food you are trying to cut with the fork while using the knife. Following up on a contact we made last year, we stopped by Duluth Pack who makes high-quality canvas, waxed canvas, and leather backpacks, sling bags, shoulder bags and a variety of other totes. These are American made products from a company that was founded in 1882. Their backpacks are extremely popular in some of the bushcrafting circles. They can customize as few or as many products as you need after a reasonable start-up fee. On the range safety front, we came across MIB2S or Modular Interlocking Ballistic Barrier System – a product of KF Armory Defense. 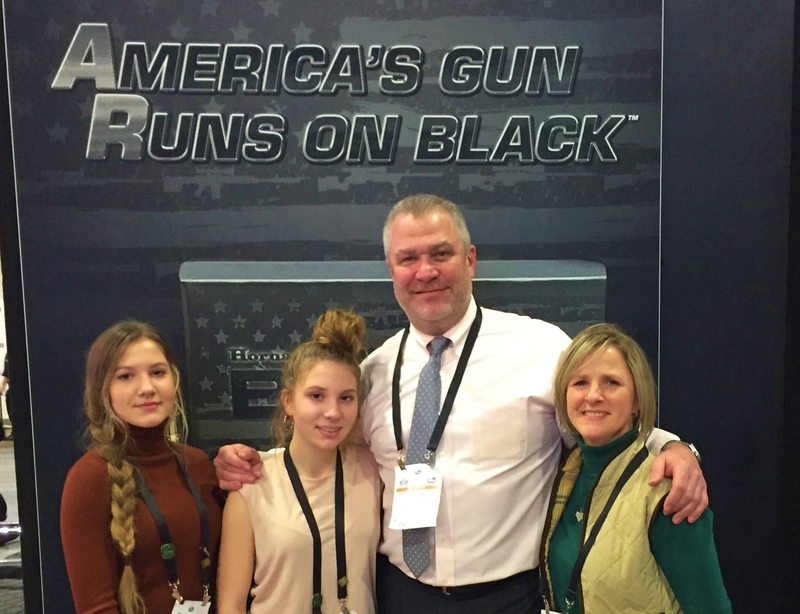 Tony Dill, Colonel USA (Retired), Senior VP of Business Development & Government Solutions, explained that these modular blocks come in three ballistic options (IIIA, IV, and IV+) dependent on the consumer’s needs. The blocks can be used for backstops, range walls, and even for training houses for police and military. The blocks absorb and capture lead and other projectile materials. Unlike a concrete wall, these blocks can be dis-assembled and moved if the consumer so chooses. They come in corner and wall blocks so side walls can be anchored to a back wall. Looking forward to tomorrow when we meet with Charles Daly and Adventure Medical. Bill and Kenyon will also be in after their travel snow delay. 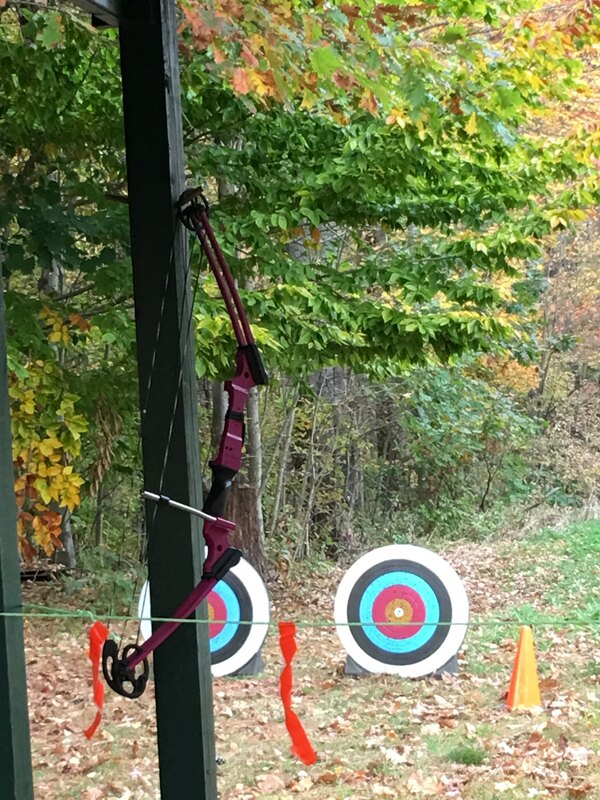 Here are some photo highlights from a New York State 4-H Shooting Sports Archery Instructor Training held in October at the Cornell Cooperative Extension of Saratoga County Education & 4-H Training Center on Middleline Rd in Ballston Spa, NY. 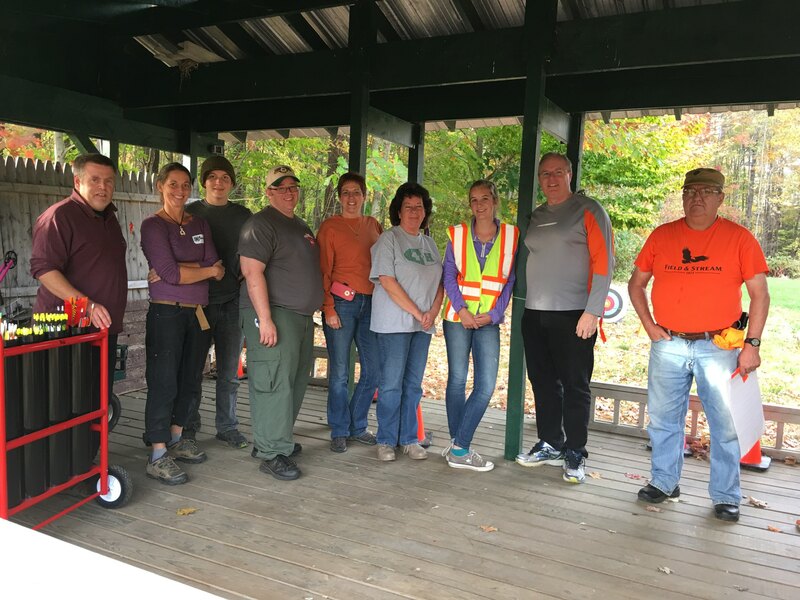 From left to right: NYS4-HSS Assistant Director John Bowe with Phaedra Zoe Stasyshyn, Drake Stasyshyn and Guy Sowle of Saratoga County, Shari Mantini of Rennselaer County, Teresa Adell of Schoharie County, Rhyann Subcliff of Warren County, Tom Woelfersheim of Saratoga County and Tom Story of Washington County.